The Ontario government has been shut down while worker’s rights are under threat and cuts to jobs and services are hurting every community. It’s time to defend everyone’s democratic and economic rights. 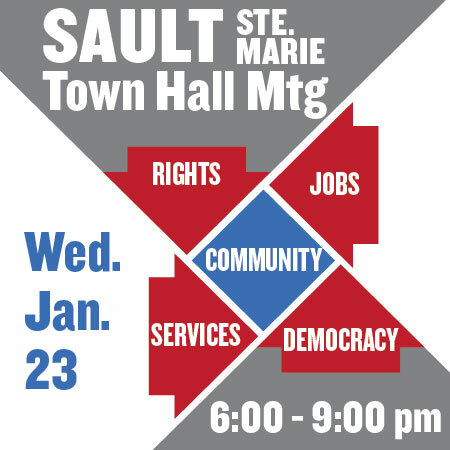 Join the Sault Ste. Marie town hall discussion on Wed. Jan. 23, 2013 @ Grand Gardens, 68 Dennis Street. Meeting: 6:00 pm to 9:00 pm. Food and refreshments provided. Everyone welcome.